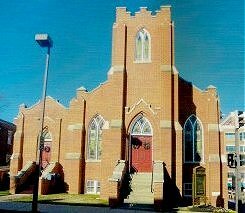 Asbury United Methodist Church is a church rich in history and steeped in significance as one of the oldest African-American churches in Frederick, Maryland. Her roots date back to 1818 when William Hammond, a free black man, purchased a lot on East All Saints Street for $60. The church, which was known as the “Old Hill Church”, was constructed by a white congregation who permitted free blacks to worship there. In 1864, blacks came into full possession of the church and by 1870 it was incorporated and renamed Asbury Methodist Episcopal Church. In 1912, when the lot on the corner of Brewer’s Alley (presently South Court Street) and West All Saints Street became available, then pastor, Rev. L.J. Valentine, convinced the congregation to purchase that property for the new church, and by 1921, the present church structure was completed. In 1939, the church dropped Episcopal from its name and became Asbury Methodist Church, and in 1945, the “Old Hill Church” building was demolished. In 1968, the church officially became Asbury United Methodist Church, which is what it remains today.